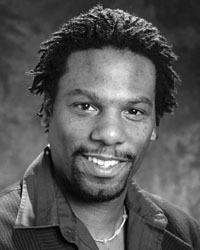 Reginald Andre Jackson is a Seattle based actor and playwright. He has performed at Seattle Repertory Theatre, Lake Tahoe Shakespeare Festival, Intiman, A Contemporary Theatre, Seattle Shakespeare Company, Book-It Repertory Theatre and Seattle Children's Theatre, among others. As playwright, his works include nationally produced stage adaptations of Christopher Paul Curtis' The Watson's go to Birmingham and Bud, Not Buddy. Other pieces adapted for the stage include Mark Mathabane's Kaffir Boy, two of Rudyard Kipling's Just So Stories, and a collection of true-life accounts by victims, refugees, activists, reporters and aid workers, concerning the horrible crisis in and around Darfur, entitled Darfur Stories. In addition to his stage work, Mr. Jackson has considerable experience working in arts and education, and frequently tours with Freehold Theatre's Engaged Theatre Program, which takes Shakespeare to Washington State correctional facilities, hospitals, homeless encampments, and other communities with limited access to the arts. He currently lives in Seattle, Washington with his love Liza, and their young son, Julius.